Ameri-Brand now offers FREE pool cover measuring in any of the areas East of the Orange Line (right side) shown on the map below. After you purchase your new cover, we will arrange to have the Factory send an experienced technician to your pool so you can be absolutely sure your new cover is made to fit perfectly. Note: This service is available for new (first time installation) and replacement covers. For replacement covers, we recommend our "copy-cat" duplicate program. However, if your cover isn't available through our "copy-cat" program, we can measure "existing" anchor placements of a previously installed cover. We can also arrange to have installers complete the installation of your cover at a very competitive rate. If you need more information on our Factory Measuring Program, please give us a call at 800-982-6966. Save some $$$ and do it yourself. For complete step by step instructions go to our 'Do it Yourself' (DIY) page. Just click this link. *Located on the "left side"? 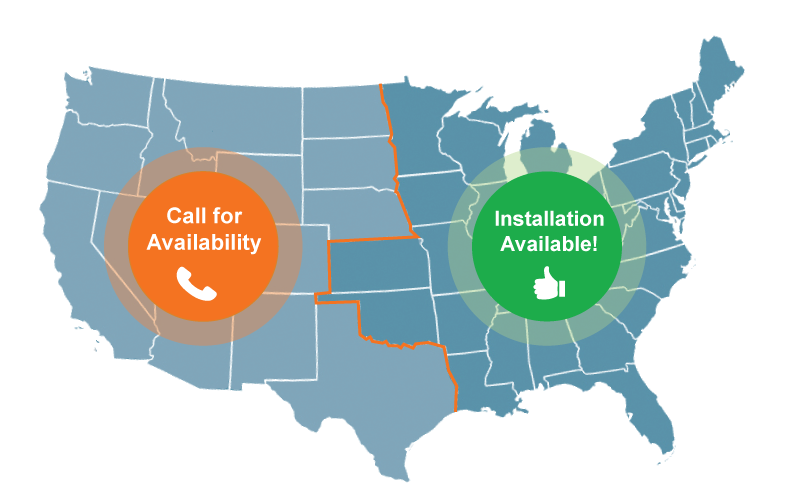 Measuring and Installation may still be available in your area. For more information, call to speak to one of our expert representatives.